The most magical film that I’ve seen in a very long time is Wim Wenders’s Pina, a documentary about the work of German choreographer Pina Bausch. It’s magical not just as a work of art, or as beautiful film, or even as an effective record of dance, an art form resistant to preservation as artifact. 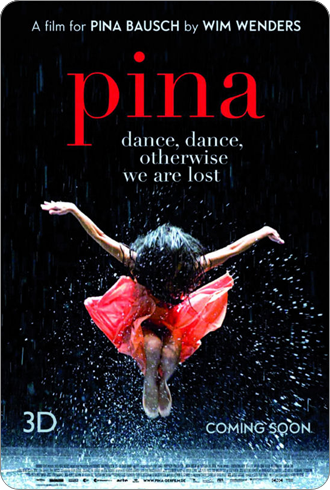 Pina is magical in the way it captures the ordinary, terrible, wonderful strangeness of being a person in a language that refuses the constrictions of conventional reality. It builds a world where you might find yourself on the monorail hanging above Wuppertal, on your way to work or school or some plain errand, when a figure veiled in crazy hair hobbles onto the train, making the sounds of crushing glass or grinding bones. It could be a creature, or a monster, but then it sits down and turns into a woman in high heels and a silk dress, lifting her hands to smooth her hair. Here, you are invited to a strangely decorous social dance where the dancers are young in one moment and old in the next, jumping through time as easily as they turn their faces. Here, love is expressed in falling chairs, or trees carried on backs, or a theater where it rains, inexplicably and impossibly, until the stage is a flooded world that dancers must splash and swim their way across. Shot in 3D, the film captures a surprising amount of the heft and immediacy of live performance. It is, for the most part, a tasteful effect. Often, when dance is put onscreen, it suffers from the flattening. We’re in the habit of translating the flat images of the screen to our rounded world, but when faced with dance on film, our eyes can find themselves at a loss. In Pina, the stage actually feels like it stretches back into distant blackness and the dancers’ limbs can curve through space. It is an all around beautiful film, anchored by four of Bausch’s pieces interspersed with portraits (in both words and movement) of her dancers. They describe Bausch as someone who helped them excavate a more raw, honest version of themselves from both their strengths and vulnerabilities. They are disarmingly human. Their admiration, appreciation, and whole-hearted commitment is stunning, and while their performances in Bausch’s work are physically ravishing, they never become alien. Wenders emphasizes this emotional bareness with stark, silent portraits of each of the dancers facing the camera alone while their voices carry on separately, talking about the woman who they worked with every day on the creation of art they believed in. Pina Bausch died in 2009, suddenly and unexpectedly, shortly before filming began. She is often quoted as saying that she was “not interested in how people move, but in what moves them.” Her work, which pushed the edges of dance and theater into each other and pioneered a new idiom for both, is an enormous and complicated exploration of that very simple idea. The dancers in her pieces are just like us, if only we escaped the decorum of social restraint. If we dropped our skins and let the things that happen inside our heads—vivid, terrifying, glorious—run wild, these are the things we would do.